The relaxed getaway that is Ace Villa represents the epitome of comfort within a tropical island setting. 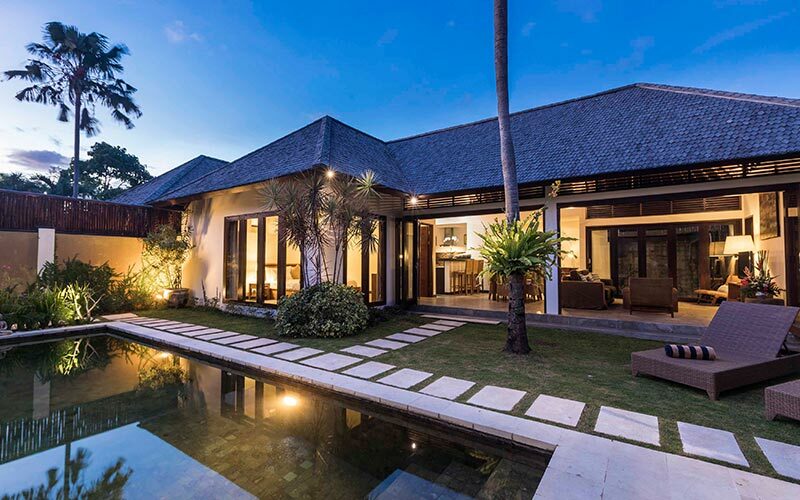 Designed in contemporary architecture with tropical island adornments, Ace Villa is located down a quiet lane in the heart of the bustling Jalan Drupadi in Seminyak. From its cozy decor to the lush greenery surrounding your very own private pool, Ace Villa is certain to provide guests a sense of deep relaxation and rejuvenation. An open‐air living and dining space lies at the heart of this residence and overlooks the private pool and terrace surrounded by lush greenery and blossoming plants. Intricately carved wooden doors, traditional sculptures, and classic paintings give guests of Ace Villa a true Balinese experience. A glass-topped coffee table is the centerpiece of the lounge which neighbors a gorgeous natural wood dining table seating up to 6 guests. Sprawl out on one of the poolside loungers to soak up the rays of the sun, or enjoy a cooling cocktail while floating around the pool. Finish off the perfect day by curling up to a good book in the lounge to the sounds of the wind rustling through the garden’s leaves. Two very generous size bedrooms can accommodate up to 4 guests comfortably. Guests of the master suite enjoy a massive second‐story bedroom boasting floor-to-ceiling windows which allow a flood of natural light to bathe the room. Complete with a separate seating area, guests can enjoy some private time to a movie or a snack from the comforts of their own bedroom. Past the walk‐through wardrobe resides the large open‐air bathroom featuring a deep soaking tub and rainforest style shower. The second bedroom is located on the first floor which can be entered through an entrance near the pool. This bedroom is also equipped with a TV/DVD player, air‐conditioning, ensuite, lounging area, and features picturesque windows overlooking the pool and greenery. Ace Villa aims to serve guests as comfortably and warmly as possible. Housekeeping and villa staff are pleased to serve and maintain a well‐run household providing support delivered with grace while Ace Villa’s manager and team are more than happy to address any questions or inquiries guests may have in order to make your stay with us as smooth and enjoyable as possible. Ace Villa is located halfway between the fashionable Jalan Laksmana commonly known as “Eat Street” area known for its trendy café’s, high‐end boutiques, art galleries, and lavish spas, and the vibrant Dyana Pura famous for its bustling music and live shows. A mere few minutes’ drive away is the popular Double‐Six beach, where restaurants with colorful beanbags on the sand, line the beach with views painted by the sunset. King size bed, ensuite bathroom with bathtub, flat screen TV & DVD player, air‐conditioning, linen, towels, safe and private outdoor living space. King size bed, ensuite bathroom, flat screen TV & DVD player, air‐conditioning, linen and towels with views over the pool. You have review for Villa ace-bali?